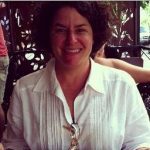 Home › Blog Topics › Advocacy/Leadership › What does $500 buy you? Do any of these responses sound familiar? Do any surprise you? How stakeholders invest in school libraries is vastly different across cities, states, and regions. This was only a handful of the responses, but the numerous others ran the gamut. In our district, the print book budgets are systematically getting slashed year after year. It doesn’t help that our school system has suffered from a serious financial crunch for a number of reasons as of late. When those making the financial decisions don’t see the payoff in investing in school libraries, then it becomes easier for them to cut the budgets. I was able to get a small amount of time with our CFO earlier in the year and was able to share a little information using our collection analyses about the age of our collections and circulation statistics, but I’m not so sure the message was getting through. It was clear that this conversation was going to have to be a longitudinal one. This Facebook post could not have been more timely as I had been asking myself some of the very same questions about stretching budgets earlier that same day. As a district librarian, I sometimes fill in where it’s needed so I have been spending time at an elementary school with a vacancy they’ve been unable to fill. 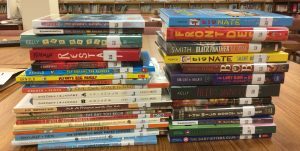 I was busy cataloging the books purchased with the $500 allotment provided by the district and remembered a tactic that was shared with me recently about creating a visual impact for stakeholders. I stacked the newly cataloged books, all 32 of them, and I quickly grabbed my phone and snapped this picture. Looking at numbers in pie charts and bar graphs can help make sense of data, but what I had in front of me was exactly what I needed. 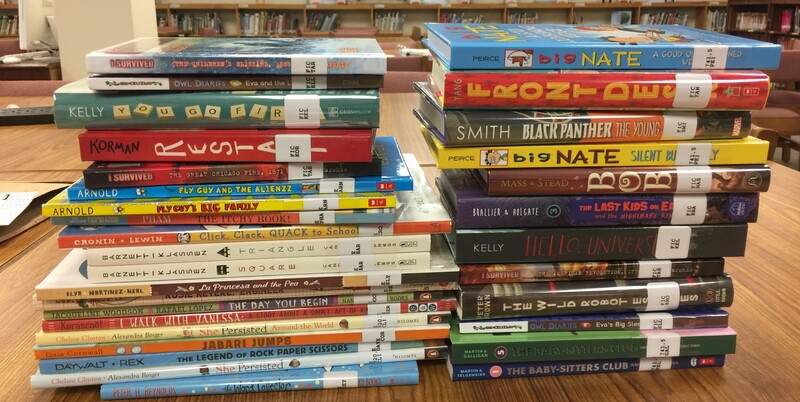 The picture shown illustrates exactly what $500 means to a school library. This elementary has 351 students and last year circulated 12,179 books, which averaged 33.7 books per student per year. The books pictured above would each have to circulate 380 times to equal the number of checkouts last year. The average lifespan of a hardcover library book is about 20 circulations. Am I expecting a sudden turnabout in the budget allotments? No. But I’ve added another snapshot to our longitudinal conversation about adequately funding our school libraries in a clear and concise manner that anyone can understand. Advocacy is not something you do once. It’s every day. You know your school library better than anyone, and if you don’t advocate for your program, no one else will. Our school and district administration support us. I wish I had specific advice that would solve every funding problem out there. Since that does not exist, I would suggest with sharing what your library is doing for students and teachers. Document the learning, the reading, the creating, and share it. Wow! This is a real thought-provoker. And I love the lines, “Advocacy is not something you do once. It’s every day… and if you don’t advocate for your program, no one else will.” I really appreciate that you coupled this sentiment with some clear, concrete, and relatively easy ways to couple data with a storytelling image (in this case, almost literally) to help raise awareness in the district of how these library cuts are impacting students’ ability to get their hands on materials.